MS Drama Club presentation of “Alice in Wonderland, Jr.” a success! “The WVMS Drama Club would like to thank everyone who came out this past weekend to see Alice in Wonderland. We appreciate your support, and hope you enjoyed the performance. 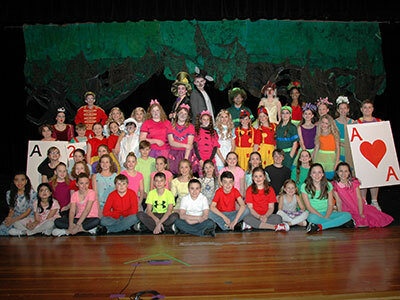 The MS Drama Club performed Alice in Wonderland, Jr. on April 1 & 2, 2016 at the Theater at Warwick Valley High School. The musical production was based on the 1951 Walt Disney film, “Alice in Wonderland,” and on the novels The Adventures of Alice in Wonderland and Through the Looking Glass by Lewis Carroll. “Alice in Wonderland, Jr.” was presented under the direction of Patti O’Connor. Middle school music teacher Christy Brown was the musical director, Jen Mosier was the vocal director and Karen Reiber was the producer. For information, contact the MS Drama Club at wvmsdramaclub@wvcsd.org.